Being the first and also the oldest high school in Vietnam, originally Quoc Hoc (National high school) was the school for children from royal and noble families. 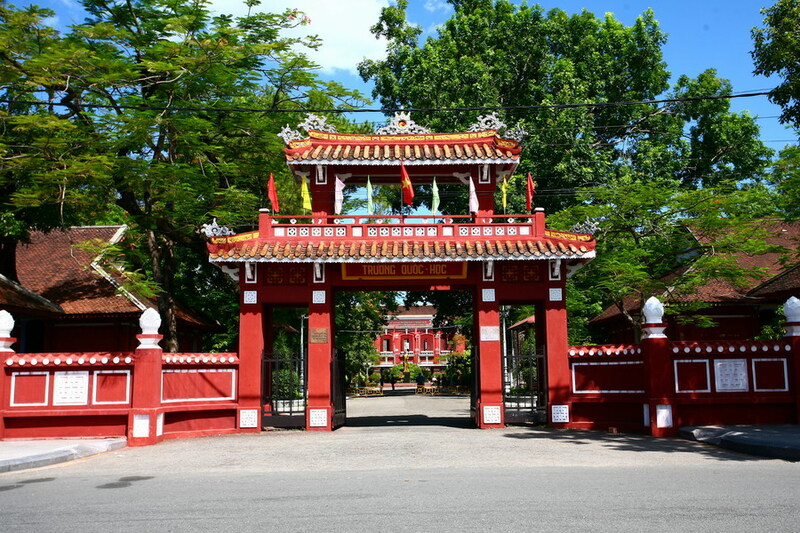 Being the first and also the oldest high school in Vietnam, originally Quoc Hoc (National high school) was the school for children from royal and noble families. On the site that used to be former squadron headquarter - a royal navy headquarters, French colonialists built this school to train those who would serve the feudal colonial government. Therefore, at that time, French was the main subject for students and the school’s gate was titled “Phap tu Quoc Hoc truong mon” (French National High School’s Gate). Now it’s named Hue National High School and is a high-profile school that all students must pass a competititve entrance exam to get the admission. Established in 1896, after more than 100-year history, Quoc Hoc today is still a well-maintained French colonial-style construction. The school is a complex of five blocks of classrooms, big football field, basketball court, five badminton courts, a swimming pool, a medium stadium and also a block of dormitory. It’s considered the largest and also the most beautiful high school campus in Vietnam. This surrounding makes a great picture of red French designed building in harmony with green background of a lot of large shady trees and stone benches. Especially in spring, when “diep anh dao” (a kind of cherry blossoms) is in bloom, the whole picture is filled with pinky dots above red thatched tile. Students often call that period of time “Pinky cloud season” and regard it as the most special moments of a year. These are the reasons why Quoc Hoc is also called “Pinky school beside Perfume River Bank” in the song with the same name. Lucky if one has a chance to drop by the school during that season. Not only is Quoc Hoc famous for its charming scene, it also gains prominence for tradition of patriotism, industriousness, academic achievements and respect for the time-honored values of teacher-student relationships. Several Vietnam political leaders have been learning here, including: Nguyen Tat Thanh (President Ho Chi Minh), General Vo Nguyen Giap, Prime Minister Pham Van Dong, etc. In addtion, the school is famed for its students who are well-known poets (Xuan Dieu, Huy Can, To Huu, Luu Trong Lu etc. ), scientists (Ta Quang Buu, Ton That Tung, Dang Van Ngu, etc. ), musicians (Tran Hoan, Chau Ky, , Nguyen Van Thuong, etc.) or sculptor Diem Phung Thi and so on. The school also has students getting high prize in many International Competitions. Tourists who want to visit Quoc Hoc High School should remember that the school doesn’t allow entrances during class’s time, which ends at 5.15 p.m. everyday (though it might be easier to go through the two side gates, in fact). What’s more, the students are very eager to talk to foreigners, especially English speakers and French speakers. That’s the place for those who want to take photos of natural background, understand more about French colonial architecture and watch female students in white aodai, sparkling in the nice background. Quoc Hoc Highschool on the east bank of Perfume river, near Trang Tien bridge of Hue City.